The Seven Years' War (1756-1763), sometimes described as 'The First World War' pitted all the major European Powers against each other, in Europe as well as in America and the Far East. The war began with Frederick the Great's, of Prussia, invasion of Saxony. 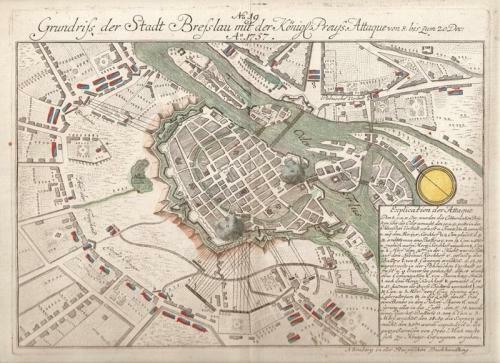 The engraving shows the City of Breslau (Wroclaw) which fell to Austria in November 1757, being besieged and retaken by Prussian forces a month later.